The IGDA in conjunction with UAT is excited to host Scott Crabtree on Tuesday April 24th at 5:30 PM in room 136 at UAT. This is a free workshop and is open to the public, so bring your friends! At GDC 2011 this talk received average ratings of 4.89/5! Come and participate in this new interactive workshop version. Neuroscience and psychology offer concrete, applicable techniques to improve morale and productivity in game development. Learn the power and limits of the prefrontal cortex, and how to help it work at its best. Learn what makes memory work-and fail to work-so you can both teach and learn as effectively as possible. Learn to manage stress-especially social stress so common in the office-that adversely affects brain performance. Learn to make yourself and your teammates happier, so your brains work better. You will leave this talk a smarter and happier game developer. 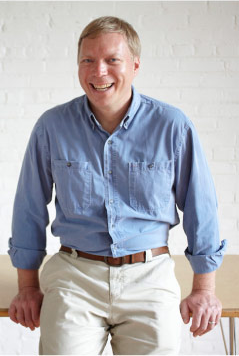 Scott Crabtree earned his Cognitive Science degree from Vassar in 1988. Immediately afterwards he worked on artificial intelligence software including expert systems. He started working at the first of several game development companies in 1996. Serving as a Software Engineer, Game Designer, Producer, and Entrepreneur, Scott is proud to have worked on game development with companies including Microsoft, Mattel, Disney, LEGO, Nike and more. He’s published games for PS2, Xbox, PC, and mobile phones including the iPhone. Crabtree is a highly rated speaker who’s presented multiple times at both GDC and the IGDA Leadership Forum.He is fascinated by and passionately studies organizational development, human psychology, neuroscience, and the science of happiness and well-being. He left Intel in 2012 to work full time on helping people and organizations apply neuroscience and psychology to become happier and more productive. Read more about Scott at www.HappyBrainScience.com. It’s going to be a great event. We hope to see you there! Standard submissions close May 1st, so submit soon if you’re interested! That’s it for now! Keep an eye out for another update soon with details about our May meeting! Hey! It’s time for some updates from IGDA PHX! MCC and ASU Present: Ken Rolston! Ken Rolston, the last in MCC’s speakers series, “Games as a Force and Art Form: Teaching, Learning, and the Creative Economy,” has over thirty years of experience in the games industry. He is, among other things, the internationally celebrated lead designer of two Elder Scrolls games (the standard hit Morrowind and the mega-hit Oblivion), as well as the IP massive-RPG (Role-Playing Game) Kingdoms of Amalur: Reckoning, released by 38 Studios/Big Huge Games. Early on in his career, Ken was the principle designer on the classic tabletop game Paranoia, as well as many fine analog games. He will be talking about the interface between board and video games and designing vast narrative games (stories that build upon one another and intertwine in such a way as to build entire self-contained worlds, much like Lord of the Rings, only in game form). Ken has a Master’s Degree from NYU and is a member of the Science Fiction Writers Association. He has been a professional game designer since 1982. 7 PM (Doors open 30 minutes prior) at Madcap Theaters in Tempe! The 96 minute film follows the dramatic journeys of game developers as they create and release their games to the world. The screening includes an in-person Q&A with the filmmakers and Adobe® prizes. 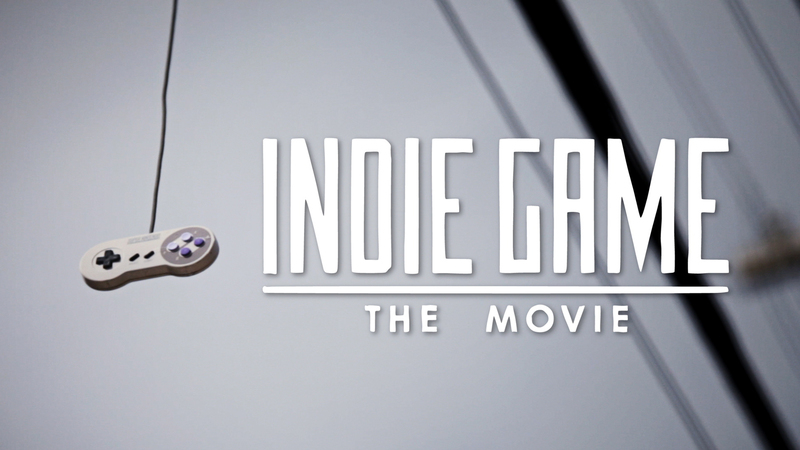 Labelled “A big hearted celebration of the artistic spirit!” by IndieWire and a “Must See” by Ain’t It Cool News, Indie Game: The Movie is a must see for anyone interested in the world of games, and game development! Use special promo code IGDAPHXIGTM to get a ticket price discount. PJ Vilsaint will be making another appearance as a speaker for April’s meeting. Come listen to the wise words of the President of Super Fun Games as you enjoy the food and drinks of Claim Jumper, and the company of your fellow game developers. Don’t miss it! Please note that this month’s meeting is on Thursday! Offspring Fling has been released into the wild! Developed by Kyle Pulver, Offspring Fling is the tale of a poor forest creature that has lost all of her children. She’ll have to run, jump, and fight her way through over 100 levels of puzzle platforming action to save them! Come to the April meeting for a chance to win a free copy of the game! Pizza vs Skeletons has been released on iOS! Developed by Tucson based RiverMan Media, Pizza vs Skeletons is a fresh look at a rivalry that’s as old as time. 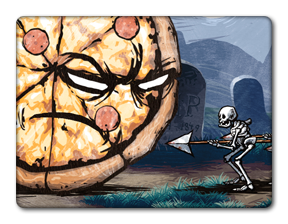 Take control of a 25 foot tall pizza as it battles a horde of undead rivals on land, sea, and in outer space! Mike Giam, the co-creator and one of the lead designers of the Twisted Metal series, Warhawk, Jet Moto 1/ 2, War of the Monsters, and many others is looking to create a small pitch prototype to shop around to his connections at major publishers like Activision, Square Enix, and Disney. He’s looking for capable Artists (2d or 3d). If anyone is interested, please email jjohnstongames@gmail.com for more information.